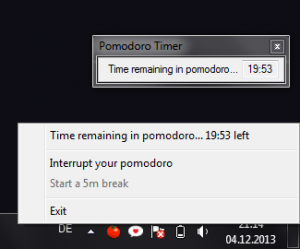 phi kappa | TomatoTomatoe – a lightweight pomodoro timer for Windows with worklog. TomatoTomatoe – a lightweight pomodoro timer for Windows with worklog. Today, a little utility for your productivity needs – TomatoTomatoe, a little pomodoro timer for Windows. Check out the pomodoro technique – it’s a nifty lifehack! The program sits in your system tray and allows you to launch a 20 minute pomodoro, which will count down in a little always-on-top window. At the end, it’ll ask you to describe and rate your pomodoro and write your notes together with the date and start/end time to a csv in a location of your choice (it’ll save your choice). So after a couple of weeks, you’ll be able to import your data into Excel and run the most amazing stats.